Good morning my awesome readers! I hope your week is going well. 🙂 Today for re-swatch Wednesday, I have two polishes that I haven’t worn in awhile and I just had to pull them out: Précision Nail Lacquer Shine Wine N Dine and Twilight Zone. I first reviewed these back in May of 2014. Shine Wine N Dine is a gorgeous berry/merlot scattered holographic nail polish. The formula on this is thin, and did go on streaky, unfortunately. This is 3 thin coats plus top coat. Twilight Zone is a warm grape scattered holographic nail polish. Application on this was much better than SWND. It did dry a bit gritty though! This is 2 coats plus top coat. I just wish the holographic bits weren’t so scattered – in the bottles it looks incredible but you lose some of that once it’s on the nail. 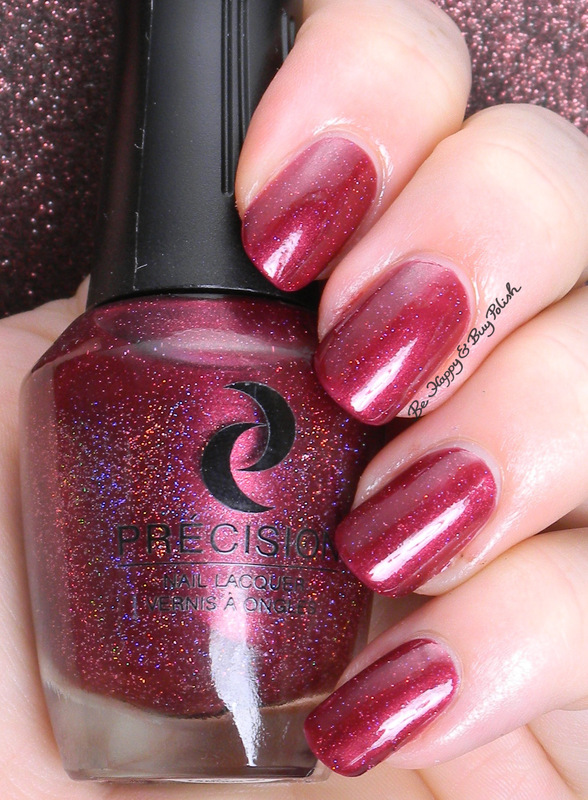 Though I haven’t featured Précision Nail Lacquer on the blog for awhile, I do like their polishes. They are reasonably priced, and have quite the selection. Both Shine Wine N Dine and Twilight Zone are still available on their website for only $5.95. Let me know which of these polishes you’d like to get on your fingernails next! Very pretty! I love nail polish, but I hate wearing it. Sometimes I will paint my nails and immediately remove it. I don’t know what it is, I just don’t like it.